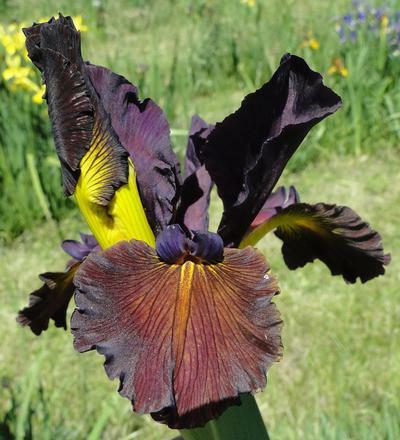 Reaper-(Jim Hedgecock-2018)-Sdlg #T-45-A-Spuria Iris-34 Inches tall-Early Medium Bloom Season-Standards ruffled red black. Ruffled lighter red black with a diffused dark yellow signals, 1/4 inch darker red borders. Reaper will certainly reap lots of raves. Great new dark from Jim's dark lines.